ANTHRO DAY: EVERYTHING 20% OFF! You know I love sharing a good sale! And for those of you not in the know, Anthropologie is my favorite store to shop! I even worked at one during my college breaks and spent my food allowance money through grad school at the Soho location (whoops!). So when I woke up to today’s email announcing Anthro Day, I had to do a quick round up! Some of my other favorites…. It’s been more than a hot second since I blogged and, quite frankly, I’ve completely fallen out of the habit. Between daily Instagram posts and IG stories, to actual client work, I’ve been focused on those areas instead of this little ‘ole blog. But I’ve missed this space. I’ve missed sharing. I’ve missed writing. So what better time than the present to jump back on the blogging bandwagon and share some random bits and pieces about what’s been going on! First and foremost, we’ve had some exciting additions come into our home….from the installation of a new mudroom and built-in office desk, to the arrival of our gloriously large 10’ custom dining table, our house is really feeling like our own. More details on these spaces in future posts! 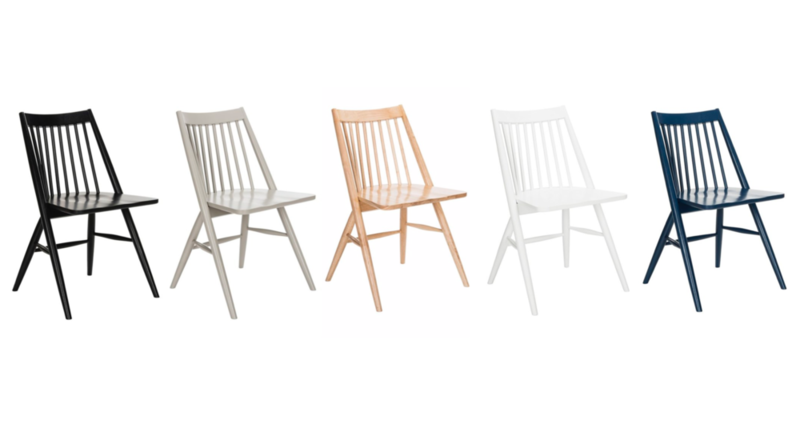 I searched high and low for the perfect new dining room chair. I wanted something family friendly, not outrageously priced, and something that was comfortable for leisurely eating. I was excited when I came across these beauties online. The reviews were great and I bit the bullet and purchased. Luckily, we are loving them in real life. They’re currently on sale for $226 for a pair and I felt compelled to share this deal! They are solid wood, available in five different finishes, and the seat is just the right size to make all tushes feel comfy and secure. We have ten around our dining table and I have two spare ones that I’m using in my office for the time being. I’m in the early stages of planning our backyard. And by backyard, I mean our courtyard. Our neighborhood’s single family homes have backloading garages (aka - they are in the back of the home as opposed to traditional front-loading garages). So in between the garage and the house itself is the “yard”. Besides the landscapers that come and take care of everything, we haven’t given this space much attention. It’s been low on the project priority list since we moved in last June. Recently, though, we realize how much we love being outside as a family. We have amazing neighbors and friends that come over, and the kids playing outside together has become a major part of our daily routine. We’re now toying with the idea of pulling up our weird Florida grass for astroturf or installing slate slabs in lieu of grass altogether. Budget will have a large part in what direction we go in, but my creative juices are flowing!!! 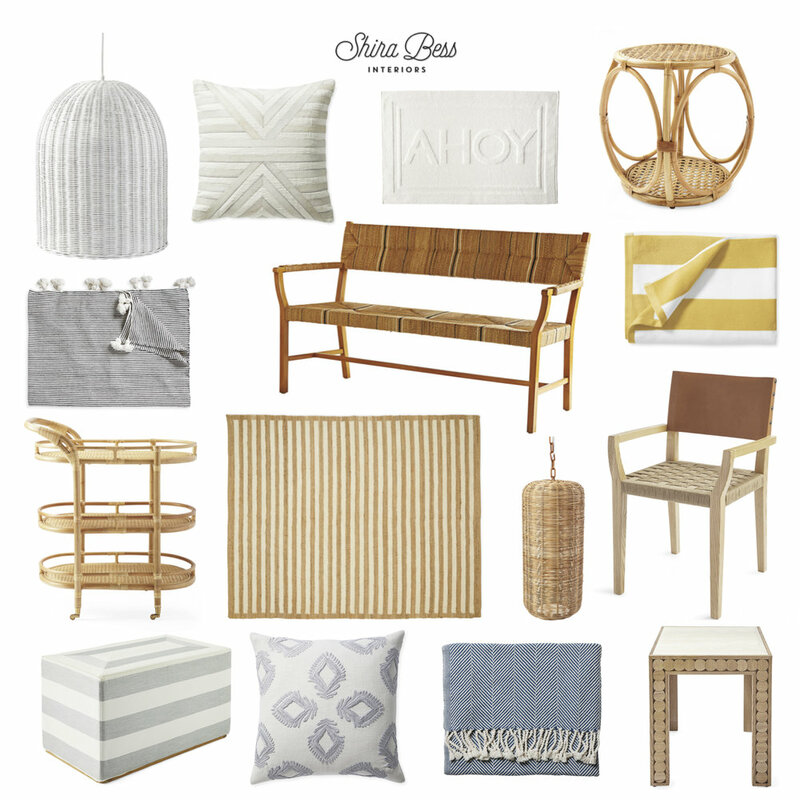 I’m feeling inspired by outdoor pieces I’ve recently seen at Target and West Elm. Have you seen them? I’ll keep you posted on where we go with outdoor space and look forward to updating you along the way! You know how I love Serena & Lily. And you also know how much II love a good a sale. So you can imagine how excited I am when those two loves collide! Right now, Serena & Lily is having their big TENT SALE and there are lots of great deals to be had. Before this amazing inventory sells out, I thought I’d share my favorite pieces….